Beach Balcony with room for dining and relaxing. Views to the South and West. Wonderful night views of the city lights. Beach Balcony hosts beautiful sunsets and incredible sunrises. Large living area with ample amount of space for relaxing and watching the waves. Another view of Living Area Large kitchen holds all the kitchenware needed for your vacation meals. Ample counter space, cabinets and breakfast bar in kitchen. Dining area seats 6 and is adjacent to the kitchen. Master Bedroom features king size bed, flat screen tv, beach views and balcony access. Master en suite bath has large walk-in shower, 6ft bathtub, dual sinks and vanity area. Second Bedroom has two full size beds and en suite bath. En suite Second Bathroom has tub/shower combination. Third bedroom has a set of bunk beds and its own TV. Third bathroom is located across from 3rd bedroom and has a walk in shower. 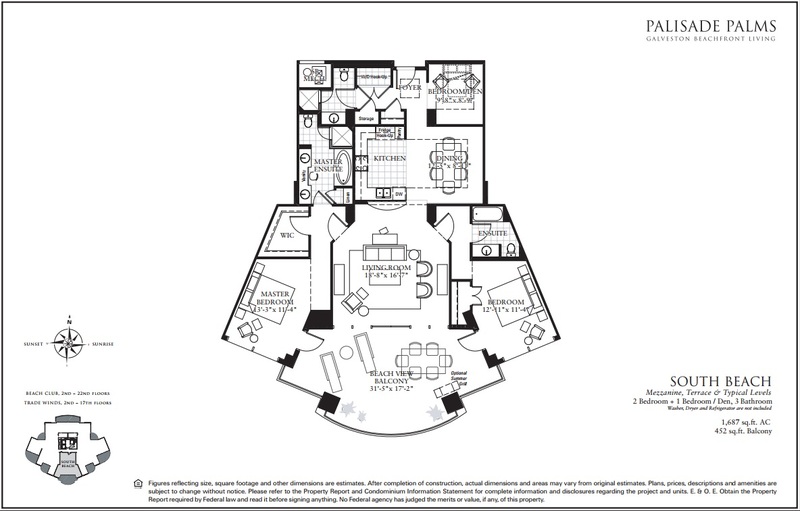 This 9th floor unit has a spacious 450 sq ft balcony! 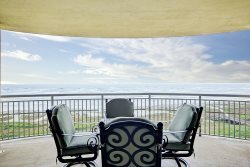 Ample balcony furniture so everyone can enjoy the open space and amazing ocean views. With a built-in grill and outdoor dining table that seats six, this is a great place to enjoy casual meals. The open floor plan includes a large living room that has a light and airy atmosphere. It includes a full-size sofa and loveseat that makes it very comfortable to relax and enjoy each other’s company. Large floor-to-ceiling windows make the entire area feel like you are on the balcony. With three bedrooms and three bathrooms, this condo is perfect for large families or two families looking to sleep eight comfortably. The Master Suite has a king bed, direct access to the balcony, and an en suite closet and bathroom with separate tub and shower. The second bedroom has two full-size beds, a great large window overlooking the sea, and an en suite closet and bathroom with a tub/shower combo. The third bedroom has a set of bunk beds that will sleep two. The third full bathroom has a walk-in shower. The fully-equipped large kitchen has all Bosch appliances, granite countertops and a breakfast bar that seats three. It has plenty of storage and cooking prep area. A separate dining room has a table for six with easy access to the kitchen. We had a such a nice time on our visit. The condo unit exceeded our expectations and there was plenty of room for my family (5 of us) plus my parents. The view from the balcony was absolutely beautiful. We enjoyed many mornings and evenings sitting on the balcony. The kids were easily entertained by the pool and beach area which we did just about every single day. We will no doubt be back. Terrific place to stay. We have been renting a place here since it opened and this unit is the best! TCR was easily available to answer all our questions. Very friendly service. We loved the condo complex and loved this particular condo. 3 adults, 4 kids. Perfect size. Nicely furnished and very well maintained. LOVED the gym. The condo was great!!! The condo had everything that is needed. Decorated very nicely. Beautiful views from balcony. Great private beach. Pool was heated. If you are going to Galveston, this is the place to stay!! !